When trying to eat healthy and maintain a tight budget, you have to get creative in the kitchen. You also have to put some forethought into your week. Look at your life and activities and think about what your plans are for the week. Will you be having any expected company that week? Here are some examples of what I have been prepping this week to help us out. I had one gallon of milk left from our weekly milk run. I turned that gallon into 4 quarts of yogurt. 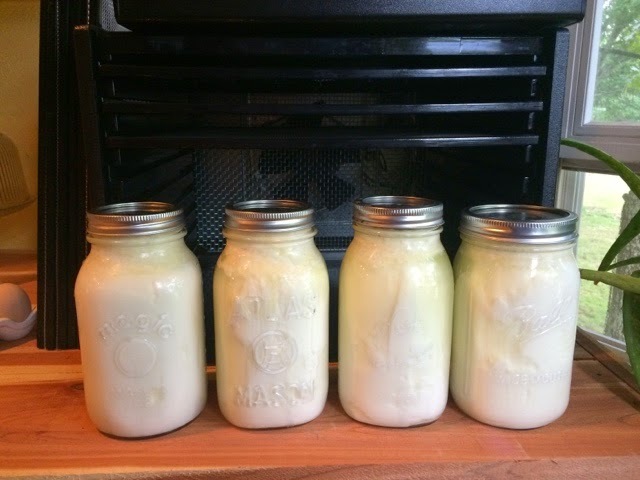 With those 4 quarts of yogurt, I have made or can make this week... fruit and yogurt popsicles, granola w/yogurt, smoothies, I can add it to chicken salad, ranch dressing for veggie dipping or salads, etc. Taking that one gallon of milk and making it into yogurt opened up a wide array of other possibilities for us. Another thing while cleaning through my freezer, I found some beef bones. I roasted the bones in the oven and made a beef bone broth afterwards. We all know how wonderful bone broth is for you! Last night with the broth, I flavored some beef patties and made a gravy to pour on top. Who said you just have to drink the broth? You can get that broth goodness into your family in other ways too! Use the broth to cook your rice! Or in some soup! Those are EXCELLENT ways to get creative in the kitchen! I also roasted a chicken early this week. With the chicken I deboned, I used the meat for chicken casserole for one meal and with the extras I made chicken salad! After deboning, same thing... I used the bones and made some chicken broth. I then canned the broth that I rendered. Keeping my sourdough going is another important factor in my kitchen. I feed it regularly and use it several times a week. I've made about 6 batches of Sourdough Banana Bread with some overripe bananas this week. Some for a church outing and some to have for some friends coming to visit and some for my husband to take along to work. I hope to make a couple of loaves of bread towards the end of the week for the weekend. It takes some work and thought, but really makes a difference! towards making your kitchen a more creative place! You have some really great tips here.